Ideally suited to the British climate, Wasabi grows best in a damp, shady spot. Forms a lush plant with leaves that can grow up to 1m (3ft) wide, Wasabi japonica makes a striking feature in a shady spot where other plants may struggle. 100% edible, so leaves, flowers and stems can all be enjoyed. The Wasabi stem is grated to produce wasabi paste - grow and taste the real thing and find out what you´ve been missing. Supplied as 3 x 9cm plants. A perennial brassica from Japan, Wasabi is a native of shady river banks high in the Japanese mountains, and grows best in a damp, shady spot – ideal for the British climate. Forming a lush plant with leaves that can grow up to a meter wide, Wasabi japonica can also be grown in a pot if you’re short on space. 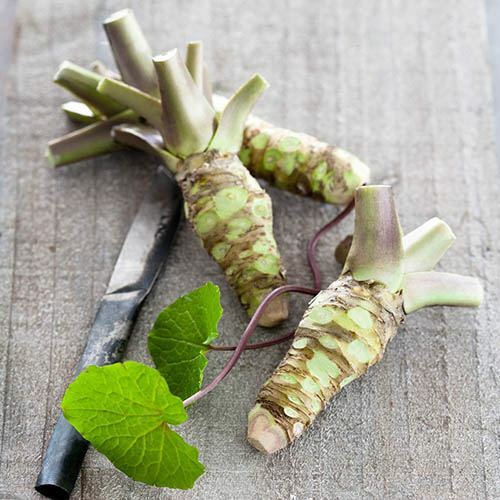 Wasabi (also known as Japanese Horseradish) is 100% edible so leaves, stems and flowers can all be enjoyed throughout spring and summer to spice up a salad while the rhizomes develop. The wasabi stem, or rhizome, is formed at the base of the plant and grows upwards above ground taking up to two years to reach maturity. It is this stem which is grated to produce wasabi paste. Once rhizomes are present you can pull the whole plant and grate your own fresh wasabi. As a bonus, you’ll get small offshoots at the base of the harvested plant, which can be separated and re-planted to continue your fresh wasabi growing. Many of the products called wasabi don't actually contain real wasabi. Grow and taste the real thing and find out what you´ve been missing. Did you know... wasabi became a preferred flavouring in Japan and was prized for its ability to counteract food poisoning. Wasabi’s ancient reputation as a healthy food comes from anti-microbial, anti-bacterial and anti-parasitic qualities. Supplied as 3 x 9cm potted plants. If you have a pond, wasabi will be happy on the edge provided shade is available. For best results, plant into a 9cm (3”) pot to establish a good root system for 4-5 weeks and harden off before planting out. Hardy down to –5ºC, protect plants on cold nights with some straw or horticultural fleece covering the crown of the plant. Provide plenty of shade in the early stages of growth. When planting outside the soil should be fertile and free draining. Wasabi dislikes sitting in water for extended periods. If planting into a container, use a 9L pot. Plant so the crown of the plant is not covered and remains slightly above the soil, allowing new leaves to emerge unhindered. Once established wasabi is easy to care for, just keep slugs and aphids away and remove any dead leaves. Keep the soil moist and feed with a general-purpose plant food. Leaves may yellow in the sun, so provide more shade if you notice this happening, plus they’ll die back in winter and should be removed.